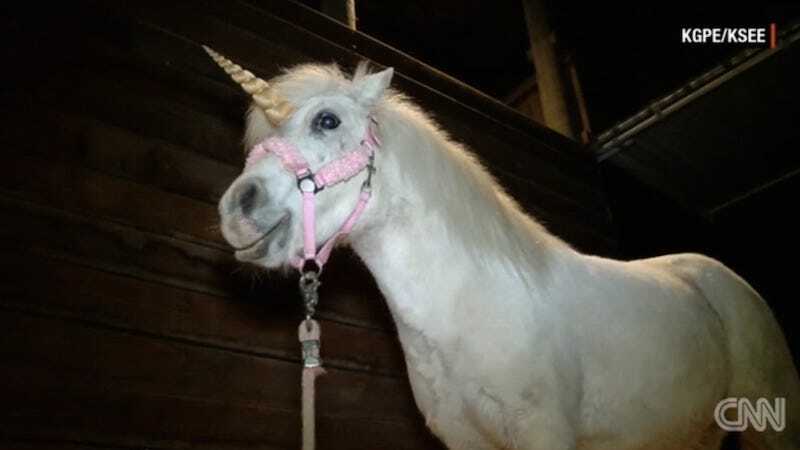 On Wednesday, Juliette, a white pony wearing a fake horn, decided she had had enough of her dead-end job (posing with children at a ranch in Madera Ranchos, California) and made a break for it, twice. The first time Juliette attempted to jailbreak, her handler caught her. The second time, she succeeded. The family hosting the photo shoot alerted the California Highway Patrol, which spent hours trying to find the runaway pony. The search became so desperate that the local police had to use a helicopter and thermal imaging to locate the pony, which was hiding out in an orchard. A neighbor lured Juliette out of her hiding place with her own horse with whom the pony is familiar. Wait, so we have a white bronco, a chase involving the California Highway Patrol, and a Robert Kardashian figure? Give this unicorn (Juice-liette, anyone?) an FX miniseries!